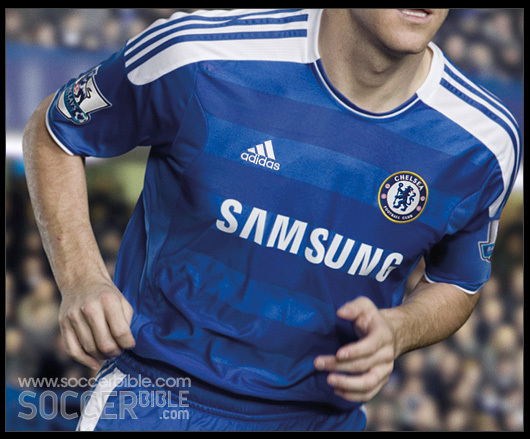 According to the official blurb, the kit features ‘distinctive elements’ of several past Chelsea kits, taking inspiration from the club’s rich heritage by incorporating ‘design features from kits used in the early 1980s’ – such as the shadow striped design on the front panel. 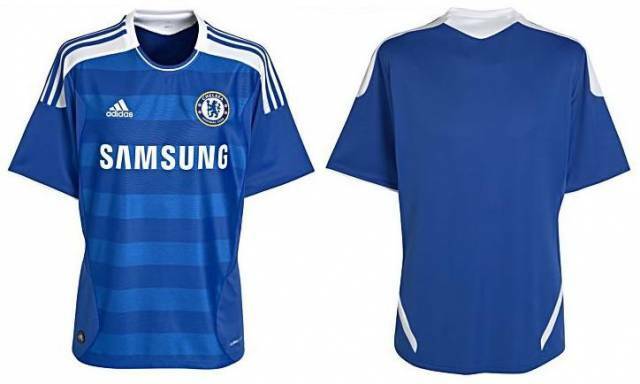 In Layman’s terms, it’s a bit of a hotch-potch of a couple of old Chelsea shirts. 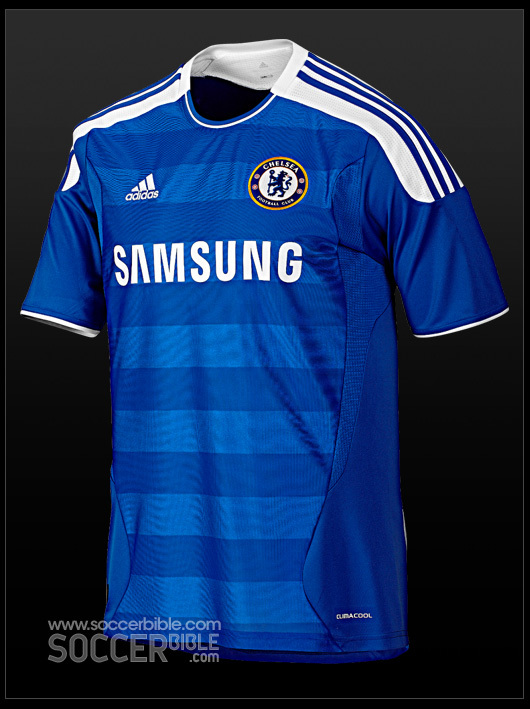 Yay or nay Chelsea-ites? Must admit, I’m not a big fan of the shirt myself. Admittedly I’m a bit of a stickler for the ‘less is more’ retro approach, but a few too many different ‘design elements’ have been crammed onto the one shirt for my liking, resulting in a bit of a ‘purchased from a Spanish flea market for €15, fabric will ignite if exposed to direct sunlight’ vibe. Additional pics via the great Soccer Bible. Too close to QPR hoops for my liking. the kit is very nice,although our real blue as been shadowed by the white stuff. I like the layers of blue, but there is just too much white on the shoulders. Adidas really make some stinkers of jerseys. After all those years of dodgy French jerseys, Nike come along and make them a beauty. Umbro make some gorgeous jerseys too. I’m still waiting for a decent Liverpool kit. Had to buy the 86-87 one to make up for it. anything with a chelsea lion is, class for me, blue is the colour. Maybe these new kits might help Torres end his drought and score a long awaited goa………..hell who am I kidding, worst 50 million spent EVER!! I don’t like what adidas do. They just mash a bunch of old jerseys together. Though this one just might prove lucky because it’s all the title winning jerseys put together. Would have looked awesome without the white shoulders. Really ruins the shirt for me. If they do something like this to Liverpool’s jersey next season I’ll be supporting West Brom. 1. Ditch excess white on sleeves and shorts. The white bit where the three stripes are, looks stupid. Would look nice with a Europa League badge on it. Torres will wear it well on the bench! That posed photo in the middle is funny. The smiles are so forced. it’s making me uncomfortable just to look at it. I wonder what they’re celebrating? New manager? Posh seats at Wembley final? I’m a Chelsea fan, and I think the kits just fine. But I wonder….did they really pose all 4 of those lads together?? I mean, REALLY?? And what were they smiling and cheering at?? Was Ashley Cole shooting at something, say, a crudely drawn portrait of Roman Abromovich or Wayne Rooney?? Nice shirt. No really…NICE SHIRT. Ancelotti is out of form. Signing Torres when u have players like Drogba, Anelka the most travelled and experience striker in the world and Kalou not forgetting Sturridge who is coming from loan soon. Ramires is a very zealous player but Benayou is far better. He can distribute the ball and he is highly experienced and currently the most skillful in the team. Above all, if u most expect Torres to shine in Chelsea, Benayou must be regular. I think it is class. unlike torres. Like the shaded hoops, a reminder of the good old days of le Coq sportif kits and Johnny Neals Blue and White army packing out home and away ends at away games when Chelsea were followed by real fans unlike the middle class JCLs that latch onto us now!